Friday night we headed out to the pub for Kirsties birthday. A good time was had by all. 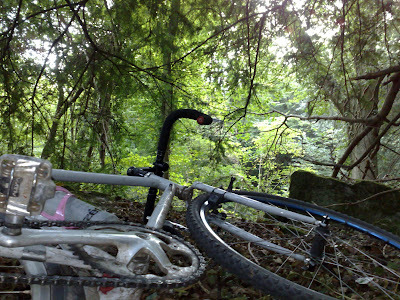 When we got kicked out I headed to the woods, a couple of hours on my town bike had me ready for bed. I set up camp in an old quarry on a comfortable bed of leaf mulch. I got woken up a couple of hours later by heavy ran drumming down on my bag. I took that opportunity to put on thin fleece. I had decided to try using a Gore Concept Gilet (thanks to Matt Carr for the loan). It's an awesome bit of kit- essentially it works like a normal gilet but if you stop you blow in to a hose and network of tubes inflate to provide a remarkable level of insulation. However in this application it didn't work too well. Firstly, most of the tubing is on the shoulders and back, This works well while stood up or on the bike, and while this will provide an element of protection from the cold ground the front doesn't really hold heat in. Secondly, after a couple of hours the tubes deflated, not surprising really seeing as I was lying on them but the fact it I was then essentially just wearing a Goretex gilet, which isn't really the tool for the job. Shame, it didn't work its a piece of kit, just not for sleeping in.